It can not be easy to be an independent iOS developer. With a marketplace to which the word “oversaturated” doesn’t even begin to apply, how do budget developers get their games to stand out? Unfortunately for Kevin Ng–developer of the new iOS arcade game Impossible Road–I don’t have the answer to that question. What I do have, though, is a boatload of praise. In Impossible Road, players take control of a white ball, steering it from a third-person perspective down an ever-growing path suspended in a stark white abyss. As the game’s title indicates, it isn’t possible to get to the end of this randomly generated road, but–much like in life–inevitable death does not serve as a deterrent here. Using virtual left and right arrow buttons, players try desperately to navigate the ball across sharp turns, bumps in the road, and death-defying bends in the track in pursuit of the next checkpoint. Soon, though, once-frustrated players learn the game’s secret; cheating is fun. Borrowing from the likes of Mario Kart’s “Rainbow Road,” Impossible Road allows–nay, encourages–players to skip parts of the track, flying off of one section and attempting to land on another. This high-risk, high-reward technique is the best way to amp up one’s score, but it’s not the easiest feat to accomplish. After launching from the track, players have about five seconds to land on another section of the winding road beneath them–a hidden countdown indicated by the fading out of the screen. At times, you’ll find yourself centimeters away from landing on the next piece of the track as the screen fades out, causing the run to end. It’s massively frustrating, but in the way that makes you start a new run immediately. That leads me to one of Impossible Road’s greatest accomplishments. Like so many games on the App Store try–but fail–to contain, this game has that addicting X-factor as seen in titles like Ridiculous Fishing and Candy Crush. With its minimalistic style and quick reload times, the end of one run leads almost naturally into the next. After a “death,” nothing but the word “AGAIN?” appears on the screen (a nice arcade-y touch), and it’s hard not to say, “Of course I’m going to try again. Why wouldn’t I?” Thirty minutes later you’ll realize you’ve missed a meeting. On the other hand, you managed to set three new high scores. We all have priorities, no? Visually speaking, the game is pretty, though its style does not lend itself to the blow-you-out-of-the-water graphics the iPad’s retina screen is capable of. More importantly is the challenge presented by the visual design. With a white ball over white space and a mostly white track, the only color present on-screen is the road’s blue highlights (as shown in the image above). This works as another of the game’s challenges. At times, players must trust where the road is beneath them, as the white ball on the screen can all-but cover up the path ahead. It isn’t a case of “difficulty for difficulty’s sake,” however–merely a part of Impossible Road’s learning curve. Speaking of presentation, the game also touts a nice little techno soundtrack that–despite multiple runs–doesn’t seem to get old. It, too, matches the minimalistic style that Ng is clearly proud to present. Undeniably addicting and massively fun, Impossible Road does have one issue to speak of. While the game knows it doesn’t play by real-world rules of physics (after all, its protagonist is a white ball careening down a winding path, suspended in mid-air), the physics system it does adhere to isn’t 100% reliable. While a decent number of interactions with the track produce the same result each and every time, every now and then you’ll find yourself flung from the road after colliding with an edge, or flying over a turn you could have sworn you were aligned to navigate correctly. This problem is slightly forgivable for two reasons, though. First of all, this is a game that encourages “cheating,” so you’re bound to run into some unorthodox collisions with the track, and secondly, with retry times so quick, it’s hard to stay mad at a “glitch” for too long. 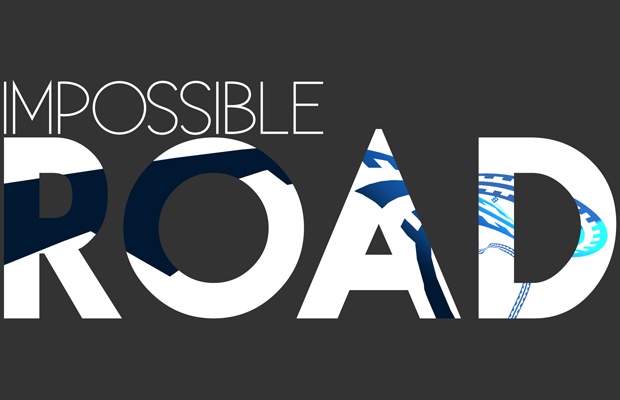 Impossible Road is a great little game that, quite frankly, will not do as well on the App Store as it should. With a price point at $1.99, players will inevitably overlook it, despite the fact that there really is nothing else quite like it on the market. That said–speaking as someone who always seems to have unused App Store money–it’s certainly worth dipping into that iTunes giftcard from grandma to give Impossible Road a try.